New York City attracts creative and entrepreneurial minds, so it only makes sense that it has comfortable spaces for people to launch their ideas into action. In the last decade, there’s been a boom of coworking spaces that have reshaped how and where professionals can work. As alternatives to traditional single company offices, coworking spaces, at their core, are hubs for innovation that provide cozy environments for getting work done and opportunities for networking. Members pay a monthly fee, and the pricing depends on whether they’re hot desking or setting aside a reserved space. There are hundreds of these spaces in New York City, so you can narrow down your search by focusing on what amenities are deal breakers for you, such as 24/7 access to work environments, furnishing, snacks and drinks, transportation proximity, mailing services, printing services, as well as community programs and events. Whether you're looking for a place with an emphasis on sustainable practices like Green Desk or a tech hub with learning opportunities like Galvanize, you can find a location in the Big Apple that best fits your budget, needs and professional goals. Read on to find the best coworking spaces in New York City. WeWork more or less launched the coworking phenomenon. It emphasizes both community and convenience. It offers custom spaces for remote, part-time employees as well as full-sized companies. With over 50 locations speckled throughout Manhattan, Queens, and Brooklyn, many New York City WeWork spots are conveniently next to major subway lines, commercial districts and popular shops. Members get access to amenities such as coffee, fruit-infused water, 24/7 space access, craft on draft, printing services, daily cleaning, office supplies and much more. Depending on your membership, there are add-on fees for mailing services and booking conference rooms. 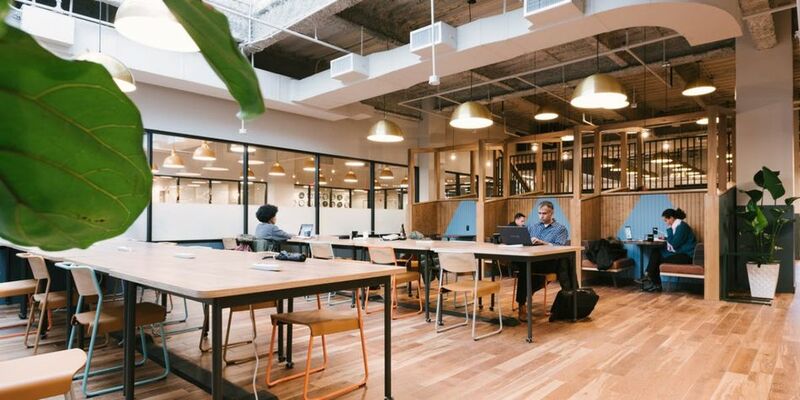 Monthly hot desk (which just means an arrangement where multiple workers use a single workstation during different time periods) rentals at WeWork start at $300 per month, though the monthly fees can cost up to $600 in many New York City locations. All members can work in any location that has hot desks. As you move around various spots and connect with WeWork’s online community, you can meet with a whole range of different entrepreneurs throughout the city. Besides hot desking, you can also choose from more premium plans such as a custom build-outs, private offices ​​and dedicated desks. Pricing, of course, will depend on the specific location. If you need a reprieve from noisy, crowded cafes with spotty Internet connection but can't seem to concentrate at home, try out Spacious. The company fixes up unused restaurants to make them convenient workspaces for freelancers and remote workers. Most locations are open Monday through Friday from 8:30 a.m. to 5:00 p.m. With 14 spots throughout New York (with ones in Bowery, Chelsea, and Nolita), Spacious' subscription only costs $99 a month for an annual plan. (The first seven days are free, and the daily rate is $24 per day). Basic amenities include Wi-Fi, coffee, tea and outlet space. Spacious setups will not offer as many resources as corporate coworking spaces, but they provide a communal setting and ample room to maintain your productivity during business hours. Located in New York's trendy SoHo neighborhood, The Farm is notorious for joining rustic features with advanced technology. As its origin story goes, its founders transported parts of a barn from the farmlands of southern Missouri to New York City. Anyone who wants to escape the chaos of the city will love the space's natural wood designs and furnishings taken from the barn decor. Some whimsical amenities include a nap room as well as a hideaway treehouse. The Farm is home to the Blueprint Health accelerator, so anyone in the healthcare industry can take advantage of networking and programming opportunities there. Private desks cost $345 a month, while shared ones cost a fraction of that price at $179 a month. You can also drop in for $25 dollars a day, with discounted access to conference rooms. Private offices for large teams start at $550 per month. Members receive 24/7 access and can use printing services and conference rooms. Located in the Chelsea neighborhood, Voyager HQ is a gathering space for travel industry leaders to network. Within the walls of the coworking area, there are opportunities to gain exclusive expert knowledge and find investors or partners. In fact, the company's network includes 150 tech startups worldwide. Its space includes one kitchen, 50 dedicated desks, three private offices and various meeting rooms. Events like happy hour, roundtable discussions and travel founder breakfasts make getting to know travel entrepreneurs much easier. Other member amenities include Wi-Fi, printing access and coffee. Month-to-month desks cost $249 per month whereas dedicated clubhouse membership costs $799 for four months. Dedicated clubhouse membership includes perks like a physical mailing address and personal locker, 24/7 building access, 12 hours of private meeting room hours per month, as well as first access to investor and corporate partners. A free digital subscription comes with opportunities to connect with travel investors and corporate partners, three days at the clubhouse every three months, plus access to postings on the Voyager job board. In 2016, Galvanize opened up its ninth campus in the West SoHo region of New York City. It includes 6,000 feet of coworking space out of its 55,000 square feet in total area. The campus amenities include conference rooms, private phone booths, bike storage, mentor and workshop programs, onsite staff, locally sourced coffee and free printing. Galvanize offers a networking, educational, business, and training hub for tech entrepreneurs in the space not reserved for coworking. Common programs include meetups, hackathons ​and coding boot camps. Galvanize is a place where people can get hired for tech ventures since many tech entrepreneurs are right at the hub. Major tech companies often host partnerships and events there, such as IBM's Bluemix Garage innovation lab launch. You can learn more about coworking prices by visiting their website and filling out an inquiry form. Starting your business, you'll appreciate accessibility and flexibility on top of competitive prices and convenient business services. A ubiquitous chain, Regus boasts over 3,000 locations worldwide with dozens of spots in New York City alone. Business professionals can take advantage of its lounge only subscription, which is great for frequent travelers and locals who need to work between areas not close to their home base. You can also pay as you go for $25 a day. Virtual offices are available for a business address and office services starting at $141 a month. Desks and private office prices depend on your specific location. Based on your membership, you can get access to a professional business address and phone number, mail receipt ​and forwarding, call answering, access to a physical office, basic business services (such as Wi-Fi, printing, fax, AV hardware, and light catering), access to other offices and even networking events. At Neuehouse, you'll find a collective of people from different artistic professions, including filmmaking, fine arts, architecture, fashion and design. The ritzy five-floor Neuehouse coworking space located in Madison Square Park has creative types in awe of its amenities geared towards artists. The coworking space offers standard services such as Wi-Fi, printing and meeting room access. But depending on how much they pay, members can also enjoy a variety of luxurious perks like cultural programming, happy hour, artisan roasted coffee, food and beverage counters, art exhibitions, Linus bikes, noise-canceling headphones, in-house production services and much more. Premium members can even access a screening room. All of these extra services and programs allow artists to form a bustling creative ecosystem. Monthly fees range from $150 for communal workspaces to $4,500 for private studios.